I didn’t write anything about this at the time but Ellie and I had a very rough start to our nursing relationship. She had what is known as a “shallow” or lazy latch. This basically meant that she didn’t stick her tongue out far enough (even though she certainly could) and so wasn’t latching on correctly. Consequently, I was in terrible pain for about 3 weeks before we got help and then it was probably another 3-4 weeks before I felt like I was really on the path to healing completely. During that time, I also got mastitis and had to be on antibiotics for 10 days. No fun. My one consolation through it all was that Ellie was gaining weight by leaps and bounds so even though she wasn’t that good at nursing, she clearly was getting enough to gain weight and be healthy. By about 6 weeks, we were doing great and I was so thankful. 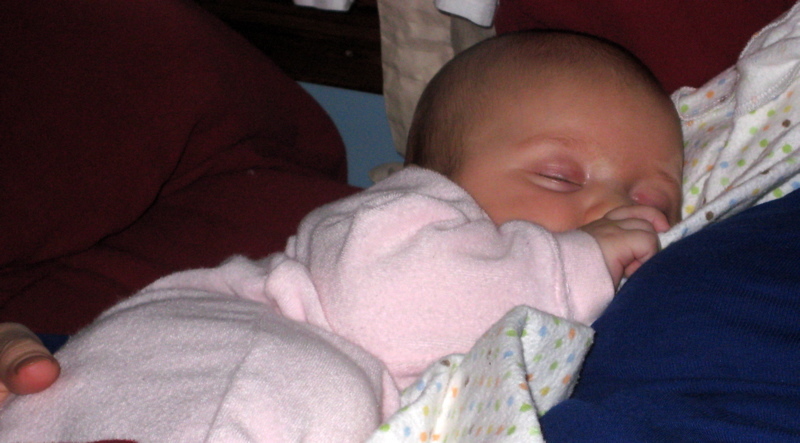 Then around 2 1/2 months, Ellie slept an extra long stretch at night (wonderful!) but my body didn’t respond well to this and I had the beginnings of an infection again. I had read that the best thing for this was to just stay in bed and rest and nurse and rest and nurse (and repeat) until the problem was gone. So we did. I had a low grade fever from around 11:00 in the morning until 9:00 that night. Thankfully, my fever broke, I fought off the infection, and I was fine by the next day. Again, no fun. Ellie in bed with me at 2 1/2 months. 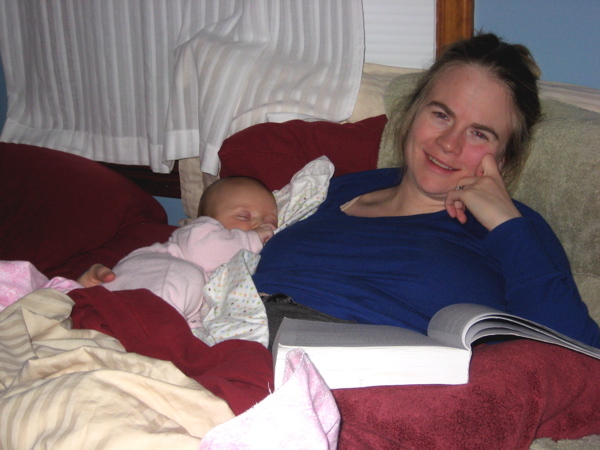 When Ellie was about a month old, my friend Kristen came over and as we were walking, we were talking about how it’s really hard when nursing is basically your only job and it’s not going well. You feel like a failure at your one and only job. And she told me that a wise mother had told her this, when Kristen’s baby was little, “Just remember – It’s worth it.” Despite the struggles, it’s worth it. Nursing with an 8-month old is so much more fun than nursing with a newborn, or even a four or five-month old. Now, she interacts with me, plays with my hair, attempts to smile while eating, generally gives me back a lot of love. And I understand what Kristen’s friend meant. It’s worth it. I am so glad I was able to make it through the pain and push through to the other side because I can’t imagine not having this way of connecting with and feeding Ellie. I am grateful that God, in his wisdom, designed babies to need their mothers like this. Not every woman struggles like Ellie and I did, thankfully! And not every woman is able to nurse her child, for a variety of reasons. This makes me even more grateful that Ellie and I continue to have a great nursing relationship and she shows no signs of stopping. This entry was posted in Ellie, nursing, parenting, reflecting. Bookmark the permalink. Joella – Thanks for sharing. I’ve been wondering how you were doing! Ellie was on a nursing strike for awhile when she was around 4 months and yes, it’s hard. 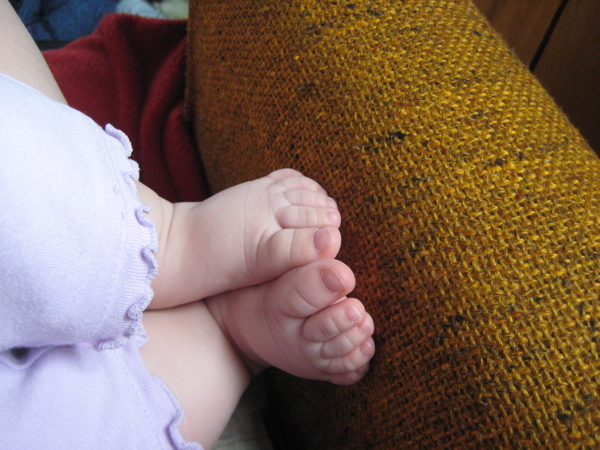 For about 3-4 weeks, she would only nurse when she was almost asleep or asleep. It eventually worked itself out but yes, hard! Good work on conquering the shields! You’re definitely not alone and yes, it IS worth it!